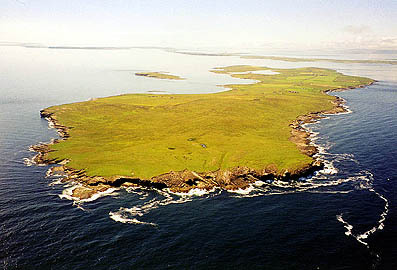 The island of Papa Westray, known locally as Papay, is one of Orkney's smallest isles lying some 20 miles north of Kirkwall. Just 4 miles long by 1 mile wide, Papay is steeped in history with a current population of around 70. Papay is green and fertile and because of this has been home to farming activity for at least 5,000 years. Indeed, Historic Scotland lists nearly 60 archaeological sites on Papay, an astonishing testimony to the immense period of human habitation. These range from the Knap of Howar, the oldest known north European houses, built and occupied a millennium before the pyramids, through a huge chambered tomb on the Holm of Papay, to ancient churches heralding the advent of Christianity down to small finds of stone axes. 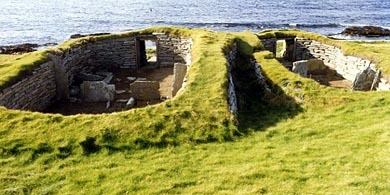 In more recent times Papay supported a population of over 300 people only as recently as the early 1900's. Despite what appears to be a dwindling population the local community are fighting hard to keep their island going. Nowadays farming is still one of the main activities of the islanders, especially the production of excellent beef cattle. Local folk are also involved in lobster and crab fishing, market gardening, building, crafts, tourism, writing and computer-based work - and essential island services. Papa Westray - Official web presence for Papa Westray. Lot's of local information and history as well as a good selection of images of the island and it's people. Also contains an excellent links page which has just about every link on the island you could wish to see. Papa Westray Community School - Picture and info packed site...not just of Papa Westray but plenty of superb pictures of other islands visited by the community school on trips. Papa Westray Ferry - Page from the excellent Undiscovered Scotland site about the Papa Westray ferry. Westray & Papa Westray Tourist Association - Local tourism site covering both Westray and Papa Westray.